IlluStory Junior is the perfect introduction to creative storytelling for younger children. 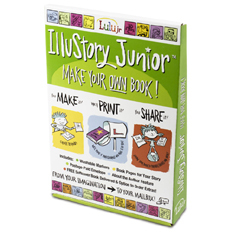 Children write and illustrate their story using the materials provided in the book-making kit and receive a full-color, professionally bound and printed 5.5”x8.5” paperback book. The kit includes 14 book pages, two cover pages, markers, instructions, book redemption form and a prepaid envelope to mail-in completed pages. Additionally, a dedication page and an “About the Author” feature on the back cover help young children transform their first stories into a real book that will be treasured by family members for years to come.